As a subordinate unified command of the United States Pacific Command, SOCPAC units deploy throughout the Pacific. SOCPAC annually conducts small unit exchanges, joint and combined training events, and operational deployments throughout the Pacific. Units are used for counterdrug and humanitarian demining operations, training forces in countries such as Thailand, Laos, Cambodia, Vietnam, and the Philippines. SOCPAC hosts an annual Pacific Area Special Operations Conference in Hawaii for over 200 U.S. and foreign delegates. The command can operate as a rapidly deployable Joint Task Force. In January 2002, SOCPAC deployed to the Southern Philippines as JTF 510, conducting counterterrorist operations with the Philippine Government under Operation Enduring Freedom. The force redeployed on 1 September 2002, leaving elements to form the Joint Special Operations Task Force-Philippines with the Armed Forces of the Philippines. The command is headquartered at Camp H. M. Smith in Hawaii. From 1995 to 1997 Air Force General Charles R. Holland commanded SOCPAC. From 2000 to 2003 Donald C. Wurster was commander, David P. Fridovich commanded from 2005 to 2007, and then Salvatore F. Cambria. In June 2009 Rear Admiral Sean A. Pybus became commander of SOCPAC. ^ "SOCPAC Change of Command". Defense Visual Information Distribution Service. 27 July 2018. Retrieved 28 July 2018. 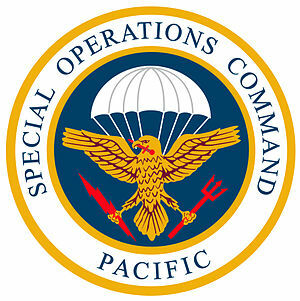 ^ a b c d "Special Operations Command, Pacific". official web site. Retrieved 9 October 2010. ^ "General Charles R. Holland". official biography. United States Air Force. 2003. Archived from the original on 22 July 2012. Retrieved 10 October 2010. ^ "Lt. General Donald C. Wurster". official biography. United States Air Force. 2010. Archived from the original on 24 July 2012. Retrieved 10 October 2010. ^ "Cambria Takes Helm at Special Operations Command-Pacific" (PDF). Special Warfare. 20 (5). September 2007. Retrieved 10 October 2010. ^ "Rear Admiral Sean A. Pybus: Commander, Special Operations Command Pacific". official US Navy Biography. 1 October 2009. Retrieved 9 October 2010. This page was last edited on 28 July 2018, at 16:40 (UTC).